Home last weekend, a little tired after a long week & wanting something light & tasty & full of flavour for dinner, but not really having the inclination or energy for too much effort, I turned to Donna Hay the doyenne of fast, fresh & simple to give some speedy inspiration for dinner. It's Spring & the garden is blooming! I came across the chicken & haloumi baked in honey & thyme & the flavours all appealed. Now this one is fast! It could not be easier. This is Donna Hay at her speedy & tasty best. Chicken is tossed together with honey, thyme & a few slices of haloumi. Seriously that is it & then all you have to do is pop it in the oven & 20 minutes or so later you have dinner. Place the chicken, haloumi, lemon zest & thyme in a baking dish. Mix the olive oil & honey together & pour it over the chicken & haloumi. Season with a good pinch of salt & some freshly ground black pepper. Pop in the oven & bake for 20-25 minutes or until the chicken is cooked through. Remove from the over & serve with a little salad on the side. The chicken tender & juicy, a little sweetness from the honey & a the hint of a more earthy note from the thyme. And then those squeaky delicious slices of roasted haloumi. 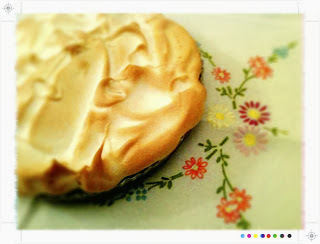 This is my contribution to this week's I Heart Cooking Clubs where we are all about Pot Luck. This is one of those dishes that is so much greater than the sum of its parts, slowly cooked onions, potatoes, eggs & olive oil...that is all. But they can come together to make something so flavourful & comforting it is really quite wonderful. The sweetness of the slowly cooked onions & the comforting softness of the potatoes create a little bit of magic. This was the perfect companion to crispy bacon, sautéed mushrooms, Worcestershire sauce roasted tomatoes & strawberry, apple & coconut muffins* for a lazy Sunday Brunch. 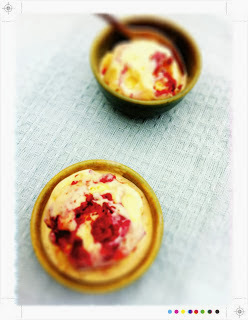 Even better the sun was shining, giving us our first little taster of the Summer months to come & brunch was all fresco. *recipes for these here soon! Toss cherry tomatoes, halve the large ones, on a baking tray lined with baking paper. Scatter over a few sprigs of thyme, a drizzle of olive oil & a drizzle of Worcestershire sauce. Season with salt & pepper & place in a 170C/325F oven for 15-20 minutes. But on to the main event....the Spanish Tortilla. Even better this can be made ahead of time so that you can enjoy brunch rather than be over the stove poaching or scrambling. Cut the onions in half, peel & thinly slice. Place the 150ml of olive in a large frying pan over a medium heat. Add the onions & season with a good pinch of salt. Turn the heat down to low & sauté for 45 minutes until the onions are sweet & golden. Stir every moment or so to make sure that they don’t stick. Remove from the heat & drain, reserving the oil to cook the tortilla. Peel the potatoes, cut in half & thinly slice. Place the potatoes in a colander with a teaspoon of salt, toss well. Place the 500ml of olive oil in another frying pan & heat over a medium heat. Gently add the potatoes & lower the heat. Cook gently for 10-15 minutes until the potatoes are tender. We are just looking for tender here, no colouring. Once cooked drain & save the oil for another time. Place the onions, potatoes & eggs in a large bowl. Season with salt* & pepper & gently mix to combine. Add the reserved onion oil to a clean frying pan & heat over a high heat until smoking. Add the tortilla mixture & give it a gentle shoogle or shake. Lower the heat to medium & cook for 3-4 minutes until the underside is golden brown. Take a plate of similar size to the frying pan & place it on top. With a couple of tea towels take hold of each side & carefully flip the pan to turn out the tortilla. Add a splash more oil & return the tortilla to the frying pan to cook the other side for another 3-4 minutes. You want both sides to be golden & brown. The tortilla is cooked when it feels solid. Slide the tortilla on to a plate & allow to cool for a few moments before slicing & serving. *Yes a little more salt....potatoes love salt. This is just one of those dishes where a few simple ingredients come together to make something quite wonderful. Sweet onions & soft potatoes all bound together in a tasty tortilla. A work morning tea to say goodbye to a team member was a good excuse to give my Kitchen Aid baby a work out & to make these tempting little treats. Do you remember upside down cakes? I have memories of Mum’s pineapple upside down cake, moist & syrupy & to top it all off a maraschino cherry inside each pineapple ring. We were ever so sophisticated back in the 70s! 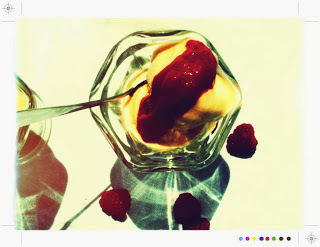 !This is a bit of a more modern take & uses my favourite berry; the raspberry. And being individual little delights the perfect treat for a morning tea. Well not quite perfect, my cake baking skills still need a little work. I think I added a few too many raspberries & a tad too much batter to each cake so they didn’t quite look exaclty like the cakes in the picture. However, they tasted great & the whole lot did get scoffed at a work morning tea so I take that as testament that were in fact pretty good. As was this delectable pineapple uspide down cake with a creme anglaise that Carmella over at Easy Food Hacks whipped up for us the other week to finish of a delicous Malaysian feast. If you want to know how to make this one you can check it out here. For the cakes make a batch of Donna’s simple vanilla cake. Pre heat your oven to 160C / 325F. Place the butter & sugar in the bowl of an electric mixer & beat until pale & airy. Add the vanilla extract & eggs & beat again for a few more minutes. Sift together the flours & the baking powder & gently fold it in to the batter. Grease some muffin tins & divide the raspberries among the bases*. Spoon over the batter & place in the oven for 20 minutes or until puffed & golden. Cool the cakes in the tins for 5 minutes & then gently & carefully invert them on to a wire cooling wrack. Dust with a little icing sugar & serve. *If using frozen raspberries, thaw them & place them in a sieve to get rid of excess juice to avoid a somewhat soggy cake. And add just a little, not even a whole teaspoon to the bottom of the tins. These little cakes are quite the tasty treat. The raspberries the perfect foil for the sweet & light vanilla sponge. I think a few blueberries would make for a lovely variation as would the old classic, pineapple, maraschino cherry optional! This is my contribution to this week’s I Heart Cooking Clubs where we are concocting a little magic with whatever we have in the pantry (& OK the freezer too for the raspberries). For more pantry magic head over here. 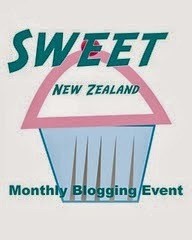 This is also my entry for this month's Sweet NZ being hosted by Lucy over at Lucy Eats. This week see the beginning of a new 6 month culinary journey with a new chef over at I Heart Cooking Clubs. Our inspiration for the next 6 months will come from Donna Hay. Donna Hay & I go way back; back to my first job here in New Zealand (13 years ago yesterday!) when I worked in magazine distribution & we launched Donna Hay the magazine. I have read every issue since then, that is quite a few issues over the last 10 years or so. I was also lucky enough to meet her a few times before moving on to my next role. 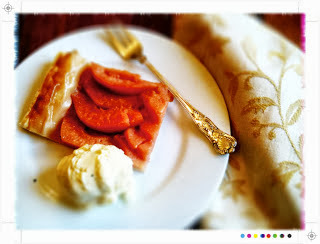 I’ll always remember that first meeting at her test kitchen in Sydney where we ate a quince tart. That started me on a love affair & eventually successful search for quince here in New Zealand . And yes it was delicious, I even recreated it quite some time ago here on Toast. Thankfully quince now make a regular appearance at veggie shops & farmers markets. I have always loved the simplicity & the way Donna show’s how easy it is to get tasty, fresh & exciting food on the table fast. Her recipes are also great basics that you can adapt & tweak to suit yourself., which I reckon is the mark of a really good recipe. I am also a huge fan of her food styling, clean & bright & light, the food always the star, no need for a multitude of props. 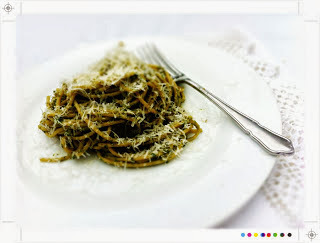 And I do love the pasta twirl! So for me her magazine & cookbooks inspire on 2 levels; the food of course but also the photos. So I am looking forward to revisiting some of my Donna Hay cookbooks & dusting off some of those old magazines, it’s like revisiting an old friend & I am sure we can pick up exactly where we left off. *I added a few chilli flakes to the pork & some fresh red chillies & spring onion to the salad for a little heat & extra freshness. Plus a little zest dressing, with rice bran oil, lime & just a splash of soy. 1 tbsp rice bran oil & a little more for cooking. Place the soy sauce, brown sugar, garlic, rice bran oil & pepper in a medium sized bowl & mix well to combine. Drizzle a little rice bran oil in a large frying pan over a medium heat. Add the pork & cook for 4-5 minutes each side until cooked through. Set the pork aside. Place the cucumber, bean sprouts, mint & coriander in a bowl, season with a little salt & pepper & toss to combine. Slice the pork & serve alongside the salad with some lime wedges. Fast & fresh this is a light & speedy dinner. 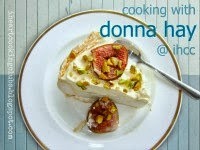 For more Donna Hay inspired creations head over here to I Heart Cooking Clubs.